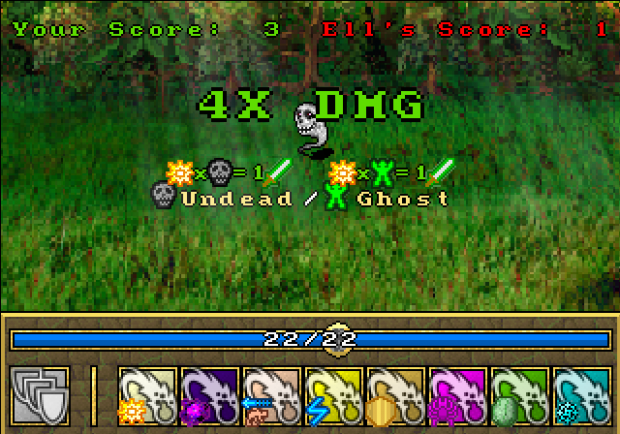 I'm proud to announce that we've reached the half-way milestone for Deity Quest, our goal for the end of the year! That means parts 1-4, along with all content, code, mini-games and quests are complete. A bunch of minor features were completed also - like the ability to change your gender. Parts 1 and 2 focus on the core gameplay and letting the player acquire followers and grow in power. Part 3 has the first quests, which are similar to locations except that you can't leave them until complete, requiring you to ration your resources and followers (having a decent active and reserve party for when the active party gets weak is recommended). Quests also have a definitive progression and end (and often puzzles to complete). You'll only be able to complete one of the two quests in part three though (your rival Ryga will beat the other), and that means that there will be one unique follower that you will not be able to convert without trading with other players (there will be other followers you can't get without trading later on as well). Little fairies need your help... but what possible reward could you get for helping them? 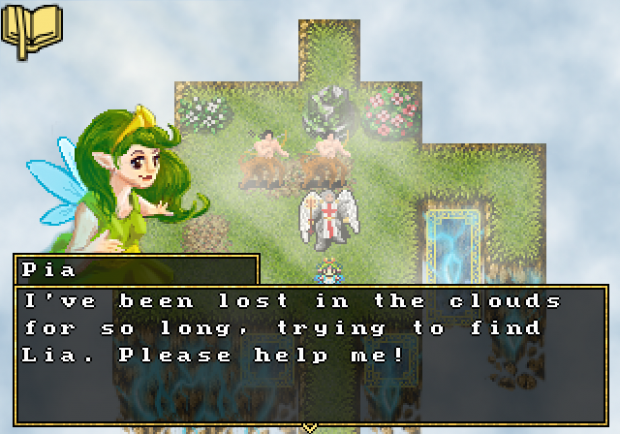 Part 4 has a similar structure to part 2 to allow the player to grow more, but also includes two mini-games with the two deities where you have to prove yourself before they will let you challenge them. There is also a hidden unique follower somewhere in part 4 - I wonder if you'll be able to find him? Part four ends with you being summoned back into the astral plane where you hear some bad news and are tasked to solve a murder mystery! You wont have to be a master detective to solve the case, but this is quite the cliffhanger for the first half of the game. Better remember your type tables, as this mini-game will test your magic skills! I don't want to spoil too much about the second half of the game, but the difficulty will be increased with some curveballs thrown into the core gameplay, there's the murder mystery to solve, and there's also a large side-quest that, if completed, will give you access to some pretty awesome unique followers. I've also solidified some of the later quests, some which will allow you to access areas from the earlier locations you were unable to before. This means I'll be going back and hiding additional followers, items and goodies! 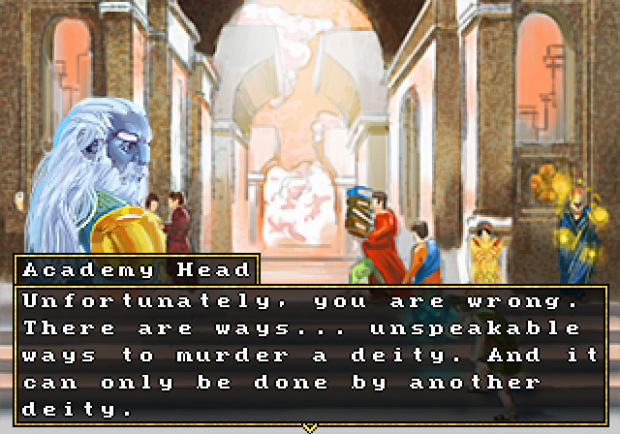 And of course, the player is the best suited deity to solve the case. So, things are moving along on schedule, and I've been getting a lot of positive feedback from testers. In fact, some people think the game is too fun and they have trouble putting it down! As always, feel free to contact me if you want to be a BETA tester, and I'll probably have another big BETA test in March of next year, with a release late March/early April depending on how many changes are needed. I've tentatively set the release date to April 2014, and while it's possible I may have to push the release date forward (perhaps as far as June), you can definitely look forward to a 2014 release! 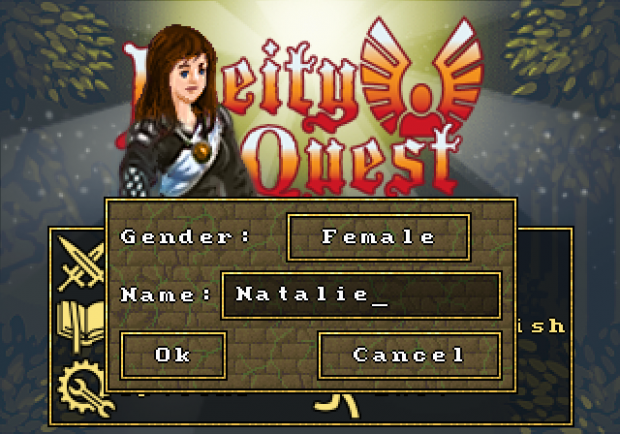 This will be an exciting year for deity quest, so stay tuned!